As the CSW58 priority theme is “Challenges and achievements in the implementation of the Millennium Development Goals (MDGs) for women and girls,” Ecumenical Women is focusing this summer on educating our online community about the MDGs and ongoing dialogue about what will follow their completion. If you don’t know much about the MDGs or even what they are, that’s okay, just click here to read an EW post on the basics. 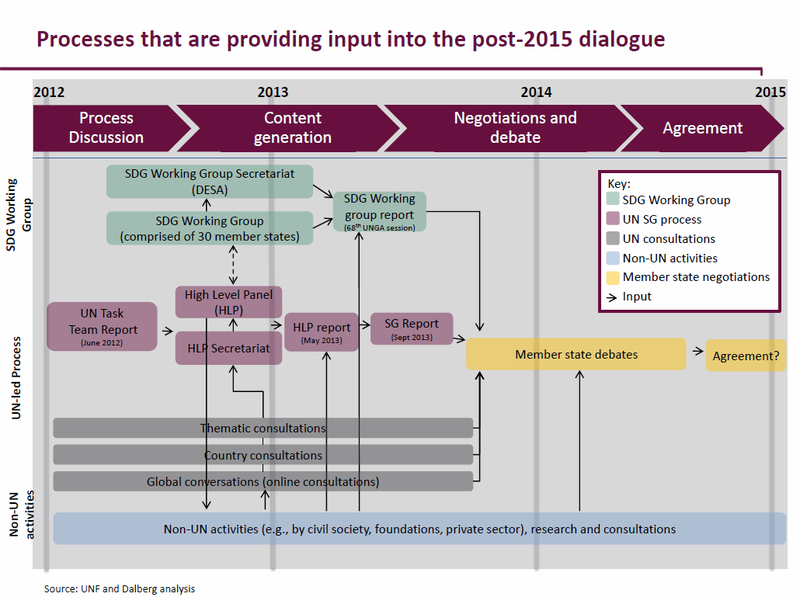 There are a number of different processes providing input into the post-2015 dialogue. Click the image below for a larger infographic timeline. Subsequent paragraphs discuss each separate process and link to relevant reports. The Sustainable Development Goals (SDGs) Open Working Group was established last January in response to recommendations from Rio+20, the 2012 United Nations Conference on Sustainable Development. While the working group is not due to present its final recommendations to the UN General Assembly until September 2014, the related Sustainable Development Solutions Network released a report on 7 May 2013 entitled “An Action Agenda for Sustainable Development.” It remains to be seen however, if the SDGs will end up representing an entirely separate set of goals or be merged into the post-2015 development agenda. Most UN Member States seem to be leaning toward the latter. As part of the UN-led process, UN Secretary General Ban Ki-moon announced the creation of a High Level Panel in July 2012 to advise on post-2015 development agenda. The panel was co-chaired by President Susilo Bambang Yudhoyono of Indonesia, President Ellen Johnson Sirleaf of Liberia and Prime Minister David Cameron of the United Kingdom. After holding meetings in each of co-chairs’ respective countries (as well as brief meeting at the 2012 General Assembly), on 31 May 2013 the panel released its final report entitled “A New Global Partnership: Eradicate Poverty and Transform Economies through Sustainable Development,” which proposed 12 measurable goals and 54 targets for global development. In partnership with the Post-2015 Development Planning Team/Executive Office of the Secretary-General, the United Nations Non-Governmental Liaison Service (UN-NGLS) is facilitating a consultation to gather critical analysis from civil society above. All these (and other) parts of the UN-led process will be considered at a “Special Event on the Millennium Development Goals” on 25 September during the 68th session of the UN General Assembly. There are also a number of non-UN inputs working to influence the post-2015 dialogue. Beyond 2015, for instance, is a global civil society campaign that brings together more than 620 organizations. Whew… that’s complicated, we know! There is good news though: YOU can participate in the post-2015 dialogue about how to ensure the rights of girls and women, end extreme poverty and sustainably grow our world. Check back with Ecumenical Women in the coming days to learn about emerging ways to get involved in the global conversation.